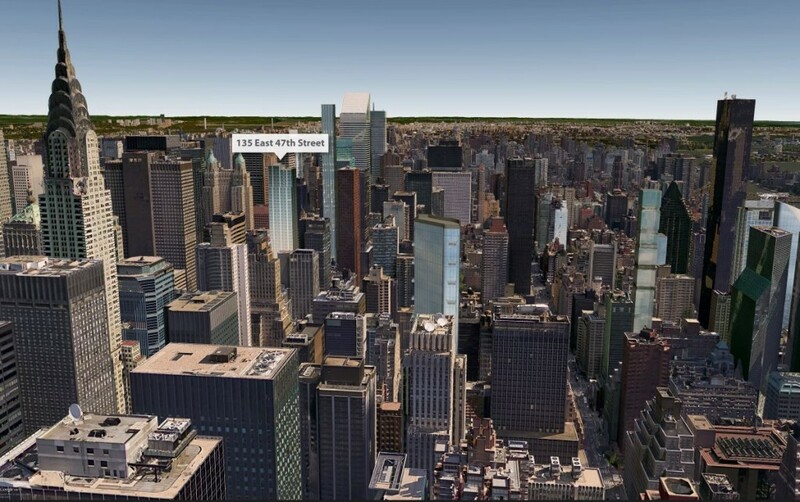 Just northeast of Grand Central Terminal at 141 East 47th Street, Brooklyn-based New Empire Real Estate (NERE) is moving ahead with plans to build a svelte 49-story condominium tower. New building permits were filed yesterday, an updated rendering has been released, and removal of the site’s low-slung structures has commenced. 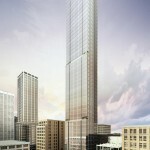 NERE’s skyscraper will rise mid-block along the northern blockfront of 47th Street between Lexington and Third Avenues. 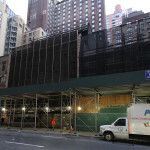 Up until the still-under-construction hotel rising at 147 East 47th Street, the block was one of the few remaining in Midtown East that had been spared the imposition of a post-war high-rises. 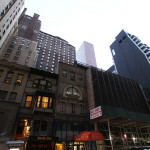 In 2002, New York Times author Christopher Gray published an article detailing the history of the late 19th century rowhouses standing between 123-147 East 47th Street. Since being built more than 125 years ago, three of the houses have been replaced by a parking garage and all of the remaining survivors have been dramatically altered. 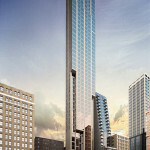 NERE is now in the process of razing the parking garage and three of the walk-ups for their 175,000-square-foot tower. The Bentley Zhao-led company picked up the the 105-foot-long development site from Gary Barnett’s Extell Development last spring for $81 million. 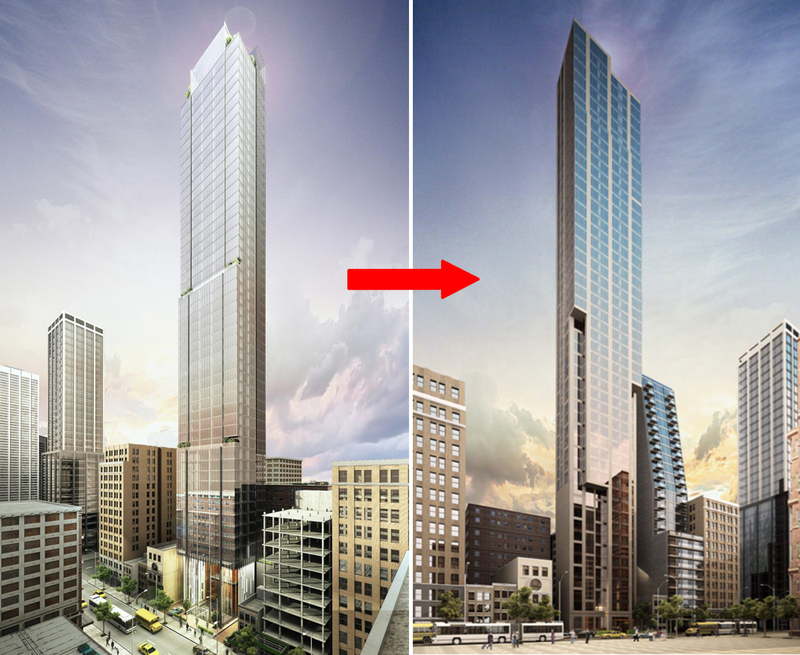 As YIMBY reported earlier today, SLCE Architects filed new building permits to build a nearly 600-foot residential tower containing 122-units. The developer told the blog last year that the building will be entirely residential with luxury condominiums. 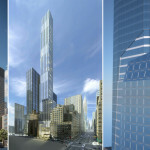 A revised design published on the developer’s website shows that the tower has been streamlined, and the soaring glass lobby shown in previous renderings has been removed. 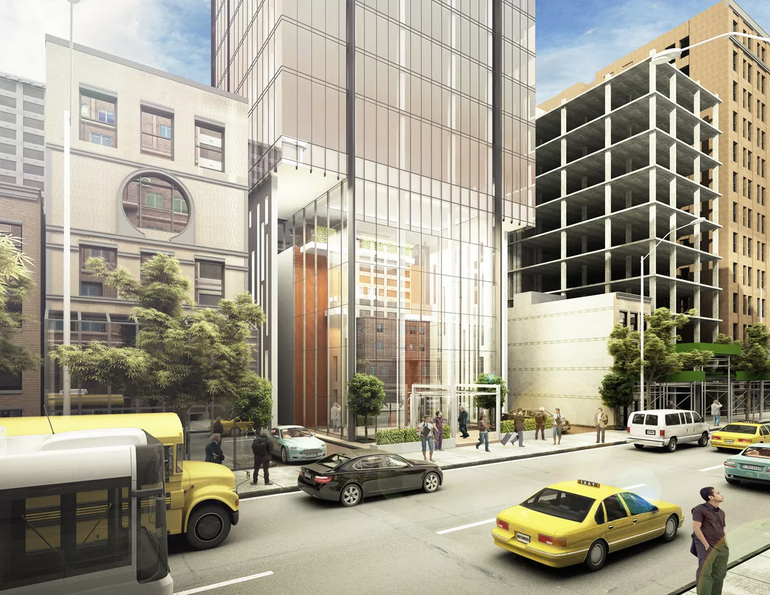 Filings indicate there will only be two to three apartments from floors two through 47, and the 48th level will house a single penthouse unit. 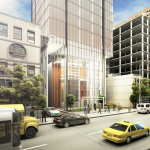 Amenities will include bicycle parking, a bi-level outdoor garden and recreational area, residential lounges, a children’s playroom, and a fitness center. 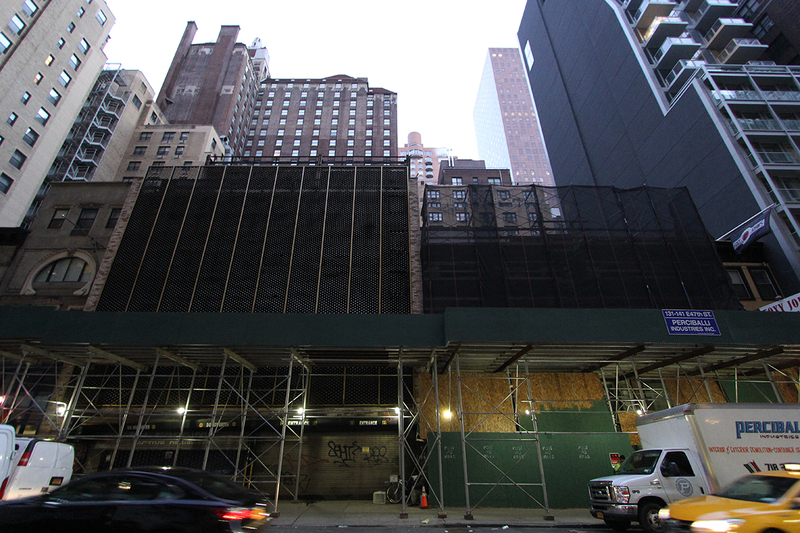 This commercial area of Midtown East, between Third and Fifth Avenues is home to a nary few residential condominiums, but several projects in varying stages of construction are looking to change that. 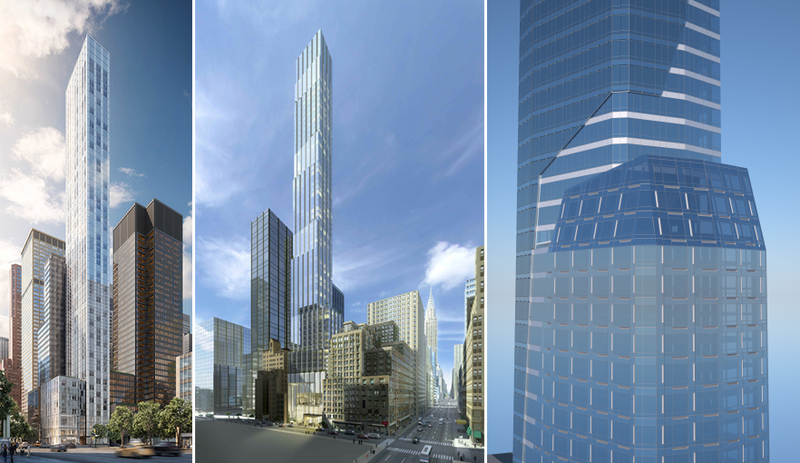 At Fifth Avenue and 43rd Street, Ceruzzi Holdings and SMI are set to begin excavation for a 71-story condominium tower at 520 Fifth Avenue designed by Handel Architects. 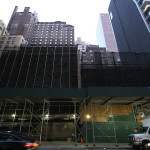 Foundation work is well underway at another Ceruzzi condo-skyscraper at 138 East 50th Street. 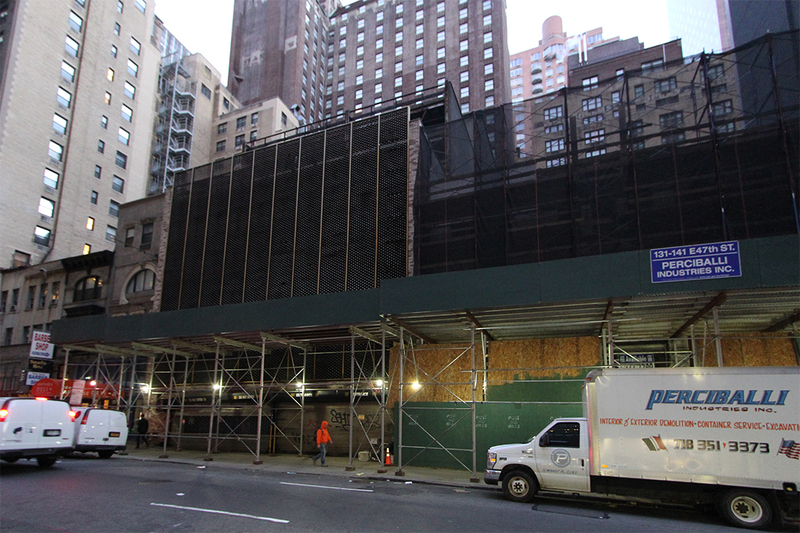 Also, the walk-up buildings at Hidrock Realty’s block-through development site at 14 East 48th Street are currently being demolished for the prospect of new condos according to WSJ. 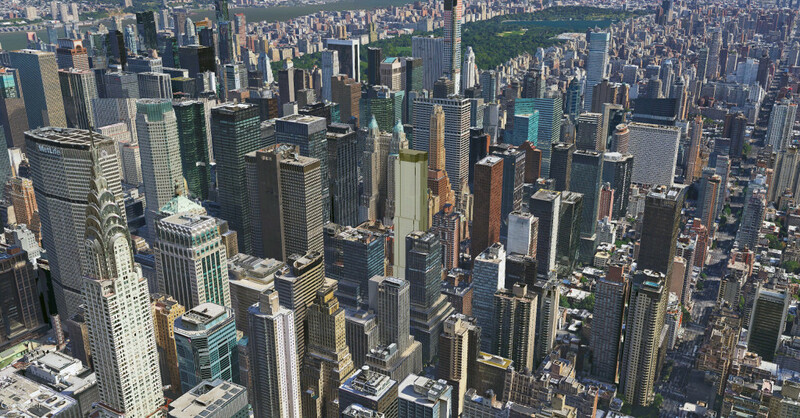 Furthest along is Aby Rosen’s (RFR) lythe and sparkling 60-story tower 100 East 53rd Street, designed by Foster + Partners. The building will contain only 94 residences, and units currently on the market are currently priced at an average of $4,426 per square foot. They range from a $3.35 million studio on the 12th floor to a stunning $65 million two-floor penthouse with views of Central Park and the East River. 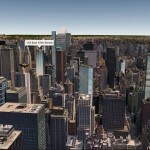 Find future listings for 141 West 47th Street at CityRealty.